Jamil Al-Amin at his murder trial. Mar. 15, 2002 update: Al-Amin was sentenced to life in prison without parole. May 24, 2004 update: The Georgia Supreme Court unanimously turned down Al-Amin's appeal, meaning that he will spend the rest of his life in prison. Speaking before the trial, Hathout had said, "There are two stories for this case. One story, told by our brother Imam Jamil Al-Amin; the other story is a different one, told by the police of Atlanta. It just happened that we believe the story of Imam Jamil Al-Amin, and we don't believe the story told by the police of Atlanta." The reason, he explained … was that "The track record of our brother is one of integrity and straight-forward speaking and a bold stance." The Atlanta police, on the other hand—like police "in so many other places" including New York and Chicago—have "not a very good track record," he charged. "Let us face it," Hathout continued. There are so many sugary talks about court, about justice, about legal system, etc. but we know and we can prove it, that in America , the legal system is not color blind and is not money blind." Nor did the efforts on Jamil Al-Amin's behalf by MPAC and its senior adviser, Hathout, end with his conviction on the charges he faced. MPAC was a member—indeed, MPAC political advisor Mahdi Bray served as chairman—of a "Support Committee for Imam Jamil Al-Amin," which took issue with the trial outcome. In a statement issued March 9, 2002, after the largely African-American jury reached its verdict, the support committee said: "We do not believe the facts presented in court warranted a guilty verdict against Imam Jamil. His defense team offered credible evidence indicating that he was not the person who shot the deputies. We believe Imam Jamil will be exonerated on appeal." "Because the death penalty has been disproportionately applied to minority defendants in America ," the committee statement added, "we oppose its use in this, or any other trial." MPAC then cosponsored a Los Angeles "Rally for Justice" in support of the convicted killer on March 24, 2002. An advertisement for the rally declared that "Despite inconsistencies and lack of evidence, Imam Jamil was convicted of these crimes on March 9 …(and) is now faced with life in prison without parole." The ad urged readers to "Join us in support of Imam Jamil!" Hathout, for his own part, argued that the issues went beyond the Al-Amin case itself to "the situation in America in general and we have to be very aware about that." "There is an organized system of injustice. It is intact. It is effective. It is viable, vibrant, and strong, and it depends on a triangle. That triangle, three-limb triangle, is racism, exploitation, blinding propaganda," Hathout continued. "You take that satanic triangle and you apply it to any case, and justice is sacrificed. To any case, to Imam Jamil Amin, to Malcolm X, to Martin Luther King, to anybody that can be subject to that malignant triangle and you can destroy that person, unless the voice of conscience within the people and within the public can object and can reject that," he said. The on-going effort to free Imam Jamil al-Amin needs our financial support now more than ever. There is an upcoming court date in the month of February. These new court proceedings are crucial because they involve exculpatory evidence that was excluded from the original proceedings. Insha'Allah, upon viewing this evidence, the court may decide to exercise its authority to exonerate our brother and release him or grant him a new trial. May 25, 2007 update: Fourteen years after it was posted, I finally note this report, "Historic Muslim Rally," written by Abaidullah A. Choudry for Message International Magazine on a rally for Bosnia that took in Washington D.C. on May 15, 1993, at which Jamil Al-Amin delivered a speech. Imam Jamil Al-Amin spoke of the need for Muslims to prepare themselves for everything. As a police helicopter ominously circled overhead, he declared to the massive crowd, "We come here today in peace, with banners and placards. But tomorrow we may come in full armament." "the nations are about to call one another and descend upon you just as those who are eating invite others in sharing their food." Someone asked [Muhammad], "will that be because we are few in number at that time?" He answered, "no, at that time you will be numerous. But you will be froth/scum carried by the torrent. ALLAH (swt) will remove the fear of you from the hearts of your enemies and will put a weakness into your hearts." Then someone asked, "What is that weakness?" He replied, "Love of the world and hatred of death." Comment: There is no deeper sickness than this notion that Muslims should love death. Feb. 20, 2009 update: Al-Amin's stalwarts say he has been locked up in "the hole": if true, one wonders what trouble he got into this time. Subject: URGENT-CALL TO ACTION! PLEASE HELP JAMIL AL-AMIN! Jamil Al-Amin has been moved to what is known in prison as "the hole". He was strip searched and placed in a cell with no bed, no control over the lights and no shower. They have taken his Qur'an and all of his other personal property. Please take some time contact the warden, and to get the word out to all of your contacts. We all need to write, call, fax or email Ron Wiley Warden ADX to inquire as to why Jamil Al-Amin has been placed in the hole. No information has been given as to why this transfer was made, but nothing could justify this inhumane treatment. In the past when action has been taken by the public on Jamil Al-Amin's behalf, changes have been made that benefited him. Please remember to keep your correspondence brief and to the point, and avoid threats, rambling etc. We want positive changes to be made. The letter then provides contact information for the warden of the United States Penitentiary Administrative Maximum Facility, known as the supermax prison in Florence, Colorado, the prison with some of the country's most notorious criminals, including such potential friends for Al-Amin as Omar Abdel-Rahman, Mahmud Abouhalima, Wadih el-Hage, Jeff Fort, Zacarias Moussaoui, and Ramzi Yousef. Karimah Al-Amin, his attorney and wife, reported that towards the end of 2008 her husband was transferred from a Georgia state prison to a supermax facility in Florence, Colo. "This stems from a March 1990 agreement between Georgia and the federal prison system that people they cannot handle could be sent to a federal facility, and Georgia would pay for it," Ms. Al-Amin explained to The Final Call. She said the imam was recently "stripped searched and placed into a cell with no bed, no shower and no control over the lights. They have also taken his Qur'an," Ms. Al-Amin said. "When he asked a guard when he could make a phone call, the guard told him in 90 days. … The continued harassment of the imam is a continuation of the government's COINTEL program," Ms. Al-Amin said. The government is also angry that he continues to preach Islam whenever he enters the prison population, she said. "It's just the way they have treated him over the past 40 years," Ms. Al-Amin said. charging Luqman Ameen Abdullah, a.k.a.Christopher Thomas, and 10 others with conspiracy to commit several federal crimes, including theft from interstate shipments, mail fraud to obtain the proceeds of arson, illegal possession and sale of firearms, and tampering with motor vehicle identification numbers. The eleven defendants are members of a group that is alleged to have engaged in violent activity over a period of many years, and known to be armed. 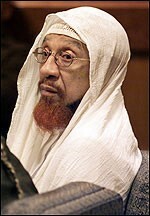 Abdullah was the leader of part of a group which calls themselves Ummah ("the brotherhood"), a group of mostly African-American converts to Islam, which seeks to establish a separate Sharia-law governed state within the United States. The Ummah is ruled by Jamil Abdullah Al-Amin, formerly known as H. Rapp [sic] Brown, who is serving a state sentence in USP Florence, CO, ADMAX, for the murder of two police officers in Georgia. As detailed in the affidavit in support of the criminal complaint that was unsealed today, Abdullah has espoused the use of violence against law enforcement, and has trained members of his group in use of firearms and martial arts in anticipation of some type of action against the government. Abdullah and other members of this group were known to carry firearms and other weapons.